And it’s not even Monday! Another scan from the CFC-Style Fan Book Vol 2, page 13. It’s a little something that didn’t make it into the R20 or SF20 art compilation books. 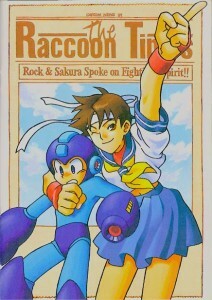 Here the cute couple of Sakura and Rockman make some headlines in Raccoon City. The denizens of that doomed metropolis could probably use a lot more than a pep talk about fighting spirit, if you ask me. Umbrella Corp’s monsters wouldn’t stand a chance against these two! Since it doesn’t appear in other books and I don’t see it listed in this one, I’m not sure who the artist is. I do know the table of contents lists it as an original Capcom piece made for this issue. No matter. I like the concept, and their poses are great. Sakura looks rather tall next to Rock. Some of the colors in this scan are a bit too bright, unfortunately, making the browns look more red. I couldn’t seem to get a nice balance that didn’t make the other colors look washed out. I’m probably going to need to get a new scanner to get nicer images, especially for the Mega Mission cards. But that’s way outside of my budget at this time. This will have to do for now, and if ever I can, I’ll put up a better scan. It looks pretty decent anyway, right? 2 Comments to "What, another update?!" Oh my gosh… where has this blog been all my life? 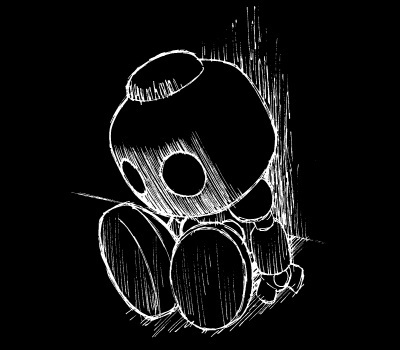 I discovered this blog entirely by accident, but I am so glad I did. It's a shame there don't seem to be many followers, but man, this place is awesome and is full of really cool, rare things. Like this rare piece of art with Mega Man and Sakura Kasugano… pure awesomesauce! I hope you keep sharing all this really neat rare stuff! I also enjoyed reading the translated Japanese article about Rockman 6 and Wily's nightmare of Rockman X. Thanks very much! I'll keep trying to post new (or should I say old) rare stuff up for you, so you'll keep coming back!